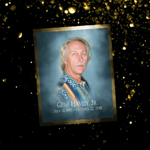 Gene Hamby Jr., 65, of Sedalia passed away Monday, October 22, 2018 at Boone Hospital Center in Columbia, MO. He was born on July 31, 1953 in Sedalia, MO the son of Robert Gene Hamby Sr., who preceded him in death and Shirley May (Nicewarner) Hamby, who resides of the home. Gene worked as a carman/welder for the Missouri Pacific Railroad. He was a master gardener and landscaper. He enjoyed building Koi ponds, fishing, and visiting with his neighbors and friends and never knew a stranger. In addition to his mother, he is survived by a daughter, Jordon Hamby of Sedalia; a sister Lisa McNeal (Jim) of Sedalia. Memorial service will be held at 11 a.m. Saturday, October 27, 2018 at Rea Funeral Chapel with Rev. Dan Hankins, officiating. Burial will be held at a later date at Salem Cemetery, Smithton. Memorial contributions may be made to the American Heart Association or to the American Lung Association in care of Rea Funeral Chapel. Not a single memory of him was I never smiling or laughing with him. My wife and I will truly miss his lovable and caring nature. Our hearts go out to you, Jordon. I will greatly miss all the goofy conversations we had sitting on my front porch. Jordan, your dad truly treasured you and never missed an opportunity to say so. My heart goes out to you and your family. Comfort and peace be with you. It was always a pleasure to see Gene at the Master Gardener Meetings. He will be missed. May you find comfort in the memories of Gene. We grew up together all the way back to Mark Twain. Sending prayers of peace.